Both the south window and the east window in the chancel are further examples of the work of Lavers and Westlake. The south window dates from 1903 and is a memorial to Sir Gabriel Goldney, Baronet, who was Member of Parliament for Chippenham from 1865-85. The window depicts episodes from the life of Joseph and his brothers from the later chapters of the Old Testament book of Genesis, with the church of Bradenstoke between Chippenham and Swindon and the District School of Pickwick shown below. Both these places were important to Sir Gabriel. Also shown are the Borough coat of arms and that of Sir Gabriel. 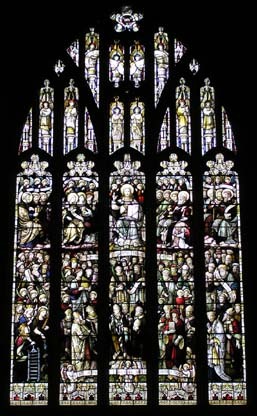 The east window was made in the Perpendicular style in 1878 and shows Christ in glory with angels, saints, prophets and martyrs praising God (the “Te Deum”). The small Norman window above the aumbry – the small safe in the wall to the left as you face the high altar where the communion bread and wine are kept – was put there after it had been removed from the old north wall of the nave when the north aisle was built. There do not seem to be any records of who created the delicately coloured figure of St. Andrew which it contains. The 17th century Laudian altar rail is of Spanish mahogany, and was designed to keep dogs away from the high altar. It was discovered during the 19th century restoration among lumber which had been stored away. The clergy vestry – formerly the north chancel chapel of St. John the Baptist – is not open to visitors. Its entrance is the Norman chancel arch with the addition of a Jacobean screen. The openings of the screen have been filled in with modern panels and a door. Since the nave altar was installed in 1982 and the choir relocated west of the screen, the chancel has also been known as the Eastern Chapel. 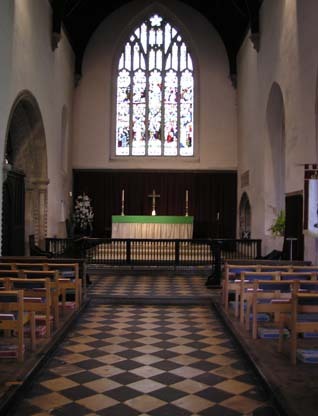 It is used for the Said Eucharist service at 8.00am on Sundays.